Ok, it’s in and working. Although there were a few issues. The placement and wiring went according to plan and the new lugs, shunt, leads and connector ends all neatly built and wired in. 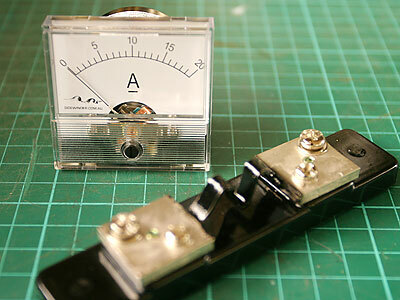 The ammeter itself was pushed into its position below the voltmeter, with just a touch of glue to hold it in, although the hole was a neat press fit and the meter felt secure without the glue. A 12volt fluro was hocked up to test things, and … nothing! The inverter was started, …nothing. The fridge, …nothing. Ok, so what was wrong? Neither circuit was registering on the meter. Time to relax and have a think. I went back to the wiring diagram I had drawn up and run past the electrical engineer. This showed a set-up which would work, but the actual wiring was slightly different. The earth lead where the shunt was installed was, in fact, a tail end with no circuits running through it. The shunt needed to be moved to inside the powered battery box, where it could be installed in the negative lead before it went to the negative terminal on the outside of the box. This was where all the circuits, (three in all) had their negative termination. As a result, the meter would be in-line with them all and record all load on the system. A quick re-wire which, luckily, required no major cable re-building, moved the shunt to the correct location and now I could test things. Here the ammeter shows the 3.5amps being drawn by the small cooler fridge. I also tested the other circuits, the inverter and the solar regulator, and they showed appropriate amounts of draw as well. I also ran a test on the little cooler and found it dropped to 5 degree C in a few hours of running. Better than I thought it would do actually considering the size of it’s tiny cooler plate. At 3.5 amps however, you’d have to keep an eye on battery condition to run it for too long. Not alot can fit in it either! Good for a few items on a trip or when running around town. I’ll do more on the dual battery set up later. And maybe a full test on the cooler too? Working this weekend on some more details for the Kombi dual battery set-up. I’ll prepare a more complete entry on the whole set-up in due course, but for now I’ll just set out my plans for this small add-on. 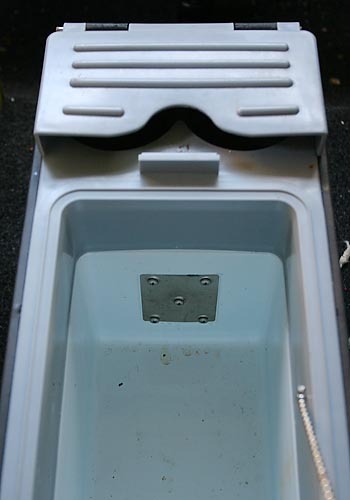 Once we start to run a few more accessories off the dual battery in the Kombi it will be good to keep an eye on the drain from the system. Particularly when I add in the portable camping fridges, which are on my wish list! So the new 20amp ammeter is to be installed in the earth cable of the auxilliary battery and with this location should pick up the drain on all three circuits in the system together. 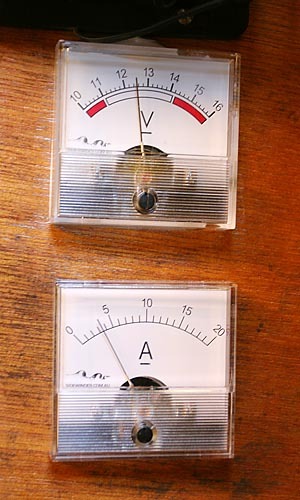 The meter and its attendant shunt are pictured. The shunt ensures the full load voltage doesn’t travel through the meter and burn it out. Part of the problem with my trial runs apparently! Stay tuned for details of the installation and tests.